On Friday, April 5th, the ~*Water Horse*~ team released their new Animesh rideable horse – something many in their group, myself included, had been eagerly awaiting. Those who follow my Content Creation User Group updates will know that Animesh allows the avatar skeleton to be applied to any suitable rigged mesh object, allowing the object to be animated. This opens up a whole range of opportunities for content creators and animators to provide things like independently moveable pets / creatures, and animated scenery features. Can be ridden by attaching it to an avatar directly from inventory, akin to the manner of a Bento attachment. However, as it uses its own skeleton, it will not clash with any other Bento attachments the avatar might be wearing. Can be rezzed in-world, where it has a range of capabilities (subject to certain land constraints), including the ability for it to be mounted and ridden. These points make the ~*WH*~ Animesh horse a very flexible new product; one that will continue to be offered alongside the ~*WH*~ Bento horses, but with notable differences, as indicated by the graphic on the right, provided by Tyrian Slade, the ~*WH*~ brand owner. A quarter horse with American riding tack and a land impact of 37. Given that all Animesh creations have a basic LI of 15, both of these horses are really impressive in their relatively low LI. As a worn attachment they also have a reasonable complexity value, adding roughly 12,000 ARC to an avatar in the case of the quarter horse. Both also have extreme compact script memory usage (231 KB). L$4,499 for the “personal version”, which can only be ridden (controlled) by the purchaser (~*WH*~ group members can purchase this for L$4,050). L$12,999 for a “public / friends” version, that can be ridden (controlled) by anyone when it is rezzed in-world. In both variants, the overall features are the same (so both variants can carry “passengers” for example), and all of the horses are supplied Copy / Modify. This latter point means that you can have multiple horses on your land for use as décor, if required, and you can add accessories (increasing their LI) or remove items (the riding tack can be removed, for example, if a horse is rezzed purely as décor), and they can be re-textured. The package for each comprises: four versions of the horse itself (with stirrups, without stirrups, jousting version, version for large avatars); separate wearable stirrups; a riding HUD; a texturing HUD; a visual guide to the HUD buttons; a texture creator kit and some (minimal) documentation (detailed documentation is available on the web). A set of gesture buttons for animating the horse when riding. Note that the button to lead the horse via its halter only applies if the horse is directly worn from inventory. 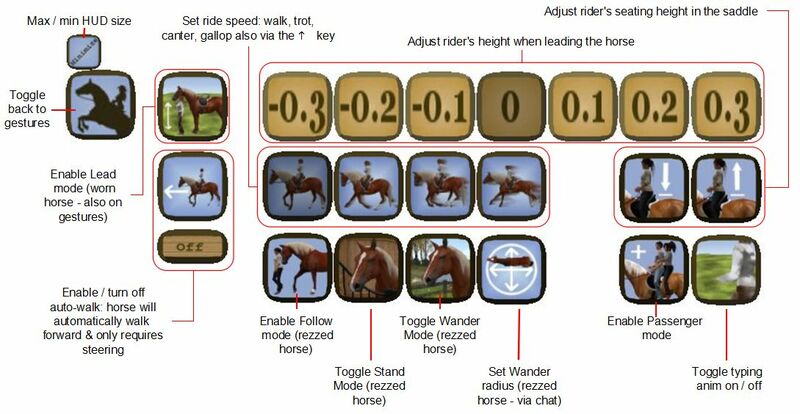 A set of buttons accessed via the gear button, combining a number of options for making adjustments to the rider, and for setting different capabilities for the horse when it is rezzed in-world (see below). Add it to your avatar from inventory as a worn attachment. Mouseover the horse in-world, and left-click. Both options will play an animation as your avatar mounts the horse. If the horse has previously been rezzed and set to wandering, the riding tack will render on it prior to the mounting animation being played. In both cases (worn or rezzed) there will be a brief pause as the riding animations are loaded. Movement is via the usual WASD / Arrow keys, with W / Up for forward motion. Speed can be increased from walk through trot and canter to gallop with further taps on W / Up; releasing the key will bring the horse to a halt. Tapping S or Down will slow the horse or cause it to walk backwards. Your vertical position in the saddle can be adjusted via the HUD or via Hover Height. To dismount a worn horse, right-click on it and select Detach. To dismount a rezzed horse, click on the viewer Stand button. Passenger riding only works with the horse rezzed in-world. Mount the horse as rider and open the HUD to the second set of options. Click the Passenger mode button (shown right). Select who you wish to have ride with you via the displayed dialogue box. The nominated person can then mouseover the horse and left-click sit. Many SL users now set their own camera presets (see: SL Camera Offsets in this blog). Due to the way camera control has been implemented in the horses, this can result on some odd camera positions for the rider (which attaching the horse) or for a passenger. Should this happen, try positioning your camera behind you and, once mounted / seated, use CTRL-mouse wheel / the mousewheel to set your camera to a comfortable position above and behind the horse for viewing. Entering the following into the console: set dynamic_pathfinding true. Note this will enable the region Navmesh, which might expose the region to the need for periodic rebakes. Use the HUD Wander Distance button to set a maximum distance the horse can wander from its current position. Click the Wander button to set it wandering. The rezzed horse can also be set to wander on prim / mesh surfaces, providing they are correctly set using Pathfinding – refer to the official documentation included with the horse for details. If you add the horse directly from inventory, you can lead it on foot by clicking either of the two Lead buttons on the HUD. Your avatar will dismount the horse and move to a position to lead it by the halter. The above only covers the essentials of using the horse – the on-line documentation should be referred to for info on texturing, custom textures, etc. This is a horse that really pushes the boundaries for Animesh, and is very good-looking, with fluid motion when ridden. It is clearly more flexible than the Bento horse. The ability for the horses to wander using Pathfinding is entirely logical, but given Pathfinding has remained unpopular and under-utilised since its 2011 introduction, it may be a while before Animesh creations using it are seen roaming freely in public regions. As well as the camera issue mentioned above, the rezzed (physical) version of the horse can gradually cant over when mounted and standing still on some mesh surfaces (see right). This can be seen in some other physical vehicles, but seems to be exacerbated by the horse’s narrow root prim. It can be corrected by starting the horse walking, or by a right-click on the horse (rider or passenger). While I understand the reasoning behind making the “public / friends” version of this horse expensive, I have to admit the stated price did have me wincing – but given it is Copy, it does mean multiple versions can be rezzed in a region (LI permitting) for the enjoyment of visitors (and potentially, it might be placed in a rezzing system set for general use within a region). For those interested in owning a horse, the choice between a Bento model and an Animesh model is a matter of personal preference. If you don’t own your own region and cannot access Pathfinding, the ability to rez this Animesh horse is perhaps not so appealing, increasing the attraction of the lower-priced Bento horse. Similarly, if you can only really ride a horse in public regions and parks, then wearing a horse from inventory might be your preferred method of use, again making a Bento horse sufficient. However, if you’re concerned about a wearable Bento horse possibly conflicting with other Bento parts you like to wear (e.g. wings or a tail, etc. ), then this Animesh model avoids that, and may be better suited to you. The best way to make a choice is to visit the ~*Water Horse*~ region / store in-world to try the demo versions of the available horse types. As per the article, it is both. It can be attached directly from inventory, and behaves in a very similar manner to the Bento horse, using the avatar locomotion graph. When rezzed in-world and ridden, it is a physical vehicle, and operates as such. I got one of the personal animesh horses. I really enjoy riding it and it looks great and it looks good wandering our property munching on grass.. One thing I was told when I ask is that pathfinding is now turned on by default. Pathfinding has always been enabled by default by the Lab since its introduction in 2012. However, at the time it was launched it received a lot of blame – accurate or otherwise – for causing performance issues (see:Lorca Linden provides data on Pathfinding and simulator performance). Because of this several of the large land providers took to turning off Pathfinding on their estate regions on receipt from LL. As such, those don’t have a full or homestead region of their own (and potentially even some who do, who are renting from a larger estate provider) may actually find Pathfinding is disabled (the multi-region estate on which we have a home island, for example, has pathfinding disabled throughout, as do the neighbouring multi-region estates). Providing people have EM rights (for a rented full or Homestead region) this can easily be rectified as per the article notes, if needed. For those renting parcels on estates where PF has been disabled, it might be a harder proposition to get changed; it depends on how biased the view towards Pathfinding the estate owner(s) have. Thank you Irara! That is believable! Since I am in SL for fun and to be with friends a I don’t need a large amount of land I rent so I’ve never bothered with all the details of estate management. I do know that it is really nice to see my horse wandering around our land and munching on grass. So far my horse hasn’t wandered into the water which is all around our home! I think that is a big plus! I do have to admit it occasionally puts its head into a tree trunk :). I still have to come up with a name for my new four leg buddy. 2. 1500L for one that is no copy. This is a great option for avis on a budget and the one I went with to dip my toe into the animesh horse world. And if you ever lose it they will instantly replace it via the included HUD. Both versions let you set riding permissions to only allow the owner or to allow anyone to ride. Teegle says they are working on adding other options too, like possibly group access. So a horse you can share with your friends for 4000 or 1500 isn’t bad at all. The Teegle’s caught my eye due to the realism of their movements. Nostrils flare and ears twitch, tail raises gracefully when they trot and when he wanders around at my club up on the stage, it’s as if he knows where everything is. They do lack many of the accessories you find for WH atm since up until recently, Teegle has been strictly avatar horses. So I bought this one knowing it would be more of a pleasure ride and pasture pet at least for the time being. They are saying many more features are forthcoming before the final release, so even if you want to just wait and see how it turns out, the Teegle is one to keep an eye on. But if you need a horse for competition right now, you really need to go with WH, since it will have the animations and tack that you need. Thanks for that… I’d been pondering getting a Teegle for comparison!